Well, I will have to do extra workouts to balance the tons of this pumpkin bread I am going to want to eat. Sarah from Bombshell Bling (formerly Craft Quickies) had this recipe handed down from her mom. Um, more please… Pumpkins and chocolate chips. Delish! Sarah even says that two of her friends got in an argument over who had the best Pumpkin Bread, and turns out they were both using Sarah’s recipe! That’s quite the testimonial! Get the full recipe at Bombshell Bling, and be sure to keep up with Sarah on Facebook, Twitter, Instagram, and Pinterest. Oh, I make a great chocolate chip pumpkin bread, but I cheat and just add chocolate chips to the Libby Bread mix. I will have to give this recipe a shot, though. 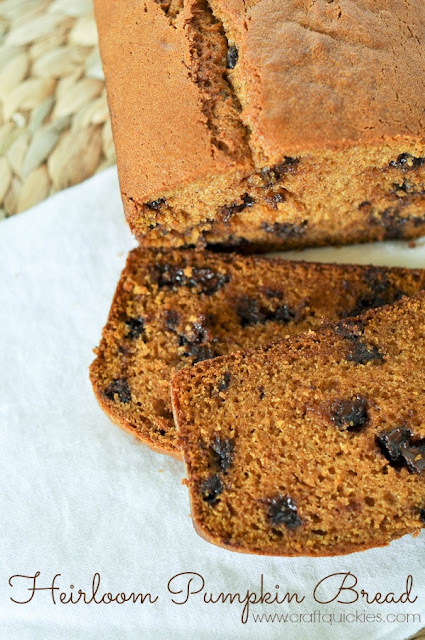 Nothing says fall like Chocolate Chip Pumpkin Bread. Thanks for the feature!!! Love ya, lady!